ww2dbaseAt the start of the European War, French cruiser Jean de Vienne was based in Bizerte, Tunisia with the French 3rd Cruiser Division. In Dec 1939, she transported French gold bullions to Halifax, Nova Scotia, Canada. When France surrendered to Germany in Jun 1940, she was at Algiers, French Algeria. In Jul 1940, she escorted battleship Strasbourg back to Toulon, France after the British attack on Mers-el-Kébir, Algeria. In Mar 1941, she was assigned to the French High Seas Fleet. In late 1942, she was put in drydock at Toulon for an overhaul. On 27 Nov 1942, during the German attempt to take over the port, her commanding officer Capitaine de Vaisseau Jacques Mailloux moved Jean de Vienne to the gate of the drydock and then flooded the ship, thus preventing the Germans from making use of that particular drydock; the ship's crew had also destroyed most of the vital equipment to prevent German salvage. ww2dbaseIn Feb 1943, the Italians raised the ship and pressed her into Italian service under the new name FR.11. She was undergoing a major refit when Italy surrendered, and in Sep 1943 she was captured by the Germans. 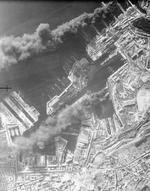 On 24 Nov 1943, Allied aerial bombing at Toulon started a fire, which caused her to slowly sink to the bottom, where she would remain until the Allies captured Toulon in Aug 1944. A refit was briefly considered, but ultimately she would be scrapped in place. 20 Dec 1931 The keel of Jean de Vienne was laid down by the Arsenal de Lorient in Lorient, France. 31 Jul 1935 Jean de Vienne was launched at Lorient, France. 10 Feb 1937 Jean de Vienne was commissioned into service. 27 Nov 1942 Jean de Vienne was scuttled at Toulon, France. 18 Feb 1943 Jean de Vienne was raised at Toulon, France and pressed into Italian Navy service under the new name FR.11. 22 May 1943 The Italian flag was hoisted aboard captured French cruiser Jean de Vienne at Toulon, France. 23 Nov 1943 FR.11 was damaged by Allied bombing at Toulon, France and sank to the bottom. 28 Aug 1944 FR.11 was captured by the Allies at Toulon, France.